The Jade-Solar Container JSC is a portable 45ft container (l x w x h = 13.72m x 2.50m x 2.70m) with a photovoltaic plant for solar energy harnessing. 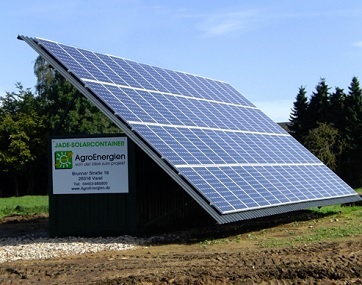 The solar energy that is produced is fed into the public grid in Germany according to the Renewable Energy Act (REA) and is reimbursed or supplied for personal use. The single pitch roof (approx. 16.00 x 7.00m = 112m²) of the Jade-solar container should face south. The horizontal alignment of the photovoltaic modules is variable and, depending on the season, to be aligned in different angles. This results in surpluses of 15-25% in comparison to fixed roof-mounted systems. A trapezoidal sheet is mounted onto the rafters of the container, on which anchors for the PV-modules are pre-installed. Afterwards, the solar modules are mounted onto the fastening system. The suitable converter and AC-sub-distribution system are pre-installed in the container. Therefore, the JSC can be installed and connected to the grid in order to generate electricity right away. Crystalline modules have a standardised output of approx. 15kWp. For further information regarding the JSC, please feel free to contact us or make an appointment to visit a reference container.